4 Berths, 4 Belts, Rear Bunks. Big News! WildAx named as the winner for Owner Satisfaction in the Practical Motorhomes Awards 2019! 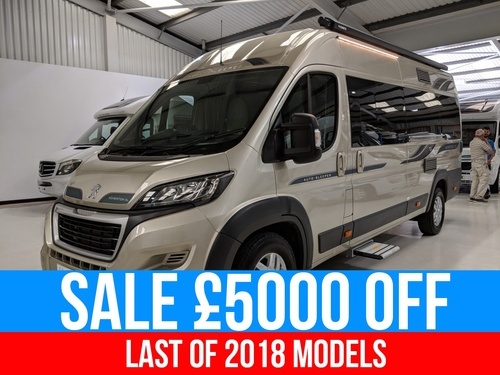 The Solaris is a very unique layout giving a full family of 4 space to eat sleep and lounge all in a 6 metre van! The Solaris is an award winning 4 berth layout with an extremely clever design. The Solaris offers 4 travel seats, 4 adult sized beds, large kitchen and washroom all in a 5.99m van. This is done whilst still giving a feeling of space - most people using the Solaris comment that they are surprised at the feeling of openness in a motorhome with so many features. 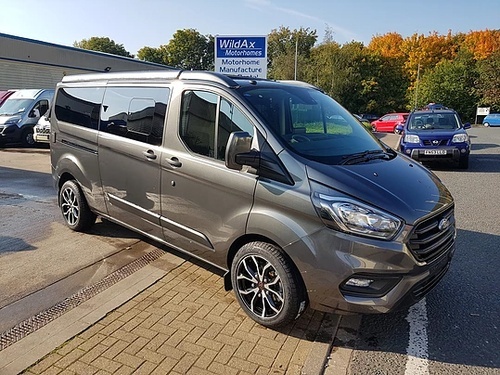 The rear travel seats fold down to a sofa and also to a large double bed (6ft2 in length), whilst the bunks (6ft long) offer a separate sleeping area and another seating zone when the top bunk is folded up to the wall. Under the bottom bunk is a large open storage area accessed from under the mattress, the side or the rear of the van. The front double is folded down from the travel seats (not using the cab seating) in less than a minute. This provides a flat and comfy double bed larger than a double mattress at home! The kitchen comprises a 90 litre 3-way fridge, sink with drainer and a full height cooker with separate oven and grill. The large wardrobe sits on top of a huge sliding larder and drawer.The living area has 2 tables for the 4 seats to use. Our flooring is a non-slip ultra durable material throughout with a set of carpets provided for extra comfort. Heating and hot water are catered for by the Truma Combi 4E gas and electric heating system. This is arguably the best motorhome heater on the market today giving controllable hot water and thermostatic heating. The Citroen Relay is now offered with the all new Euro 6 engine. This new Relay is upgraded in many ways from the previous model with increased fuel efficiency. Figures provided by Citroen show a combined MPG in excess of 46! The Citroen Relay drives like a car with light and easy controls and great visibility. The Relay is also a very reliable vehicle designed for the robust commercial world gives great peace of mind in the motorhome marketplace. It also gives the perfect shape and size for a motorhome. Leather steering wheel and gear knob. Upgraded twin leaf rear suspension. Fly screen at sliding door opening. Sliding Larder and drawer storage. 230v socket & double USB charging socket.